Denny Brauer Says "Time for Docks"
ZAPATA, Texas. — High winds on Falcon Lake Sunday morning, and a forecast that the winds will continue throughout the day, forced the postponement until Monday of the final day of the Rigid Industries Falcon Slam out of Zapata, Texas. All 12 anglers who qualified Saturday for the final round will return Monday to Falcon to compete for $100,000, a berth in the 2014 Bassmaster Classic and 100 points toward the 2013 Toyota Bassmaster Angler of the Year race. After Saturday, the leader was Keith Combs of Huntington, Texas, with 83 pounds, 3 ounces. He was 1 pound ahead of four-time Bassmaster Classic champ and fishing legend Rick Clunn of Ava., Mo. Combs, who has led the Slam for three days running, agreed with the decision by B.A.S.S. officials. Combs had a reminder Saturday of what can happen when a boat is dead in the water. He had a minor mechanical issue on Saturday that couldn’t be fixed on the water, so he called in for a tow. When his fellow Elite pro and Texan Clark Reehm happened by and offered the back seat of his boat, Combs jumped aboard to finish out the day. He landed his fifth fish for a limit, which kept him ahead of Clunn. Combs said Sunday his boat was fixed in five minutes Saturday night and he was ready to go on the water. “With big waves and big winds, when equipment fails, you can get into a bind very quickly,” he said. Clunn, in position to claim his first Bassmaster win since 2002, also agreed with the decision to postpone. “I’ve objected to almost every cancellation based on a forecast. This is not a forecast; the dust storm is here,” he said at the launch site, a cover over his face to protect from the grit that was blowing up from land. Clunn would have had a distinct advantage in a wind-blown Sunday final round. The spot on which he has bagged 82 pounds, 3 ounces in three days is only a half mile from the launch site, and is in a relatively protected area. On Saturday the spot produced the event’s largest bag yet, 36-14. “I would have a 90 percent chance to win today. Tomorrow, when everyone could get to their spots, I give myself 50 percent,” he said. The Monday competition is scheduled to begin at 7:15, or first safe light, from the Zapata County Boat Ramp in Zapata. The Top 12 will weigh their catches at about 3:15 p.m. Fans are invited to watch. All Bassmaster events are free. 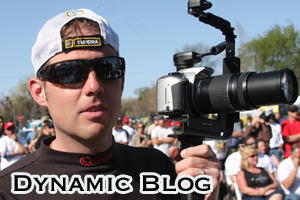 Full coverage will continue on Bassmaster.com.